- combine ingredients (B) and leave aside. - combine ingredients (A) in a large mixing bowl. - then stir in ingredients (B) untill form a soft dough. - leave to rest for an hour or untill double in size. - punch out the air and knead dough untill smooth. 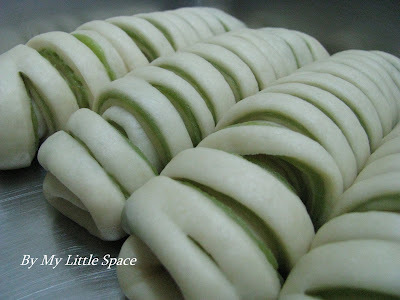 - divide into 12 portions both bread dough & mung bean paste. 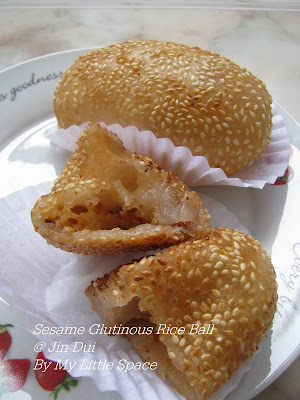 - wrap mung bean paste into bread dough and roll out flat. 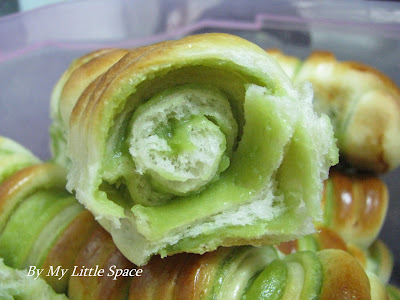 - make a few fine cuts to the dough and roll them up (as shown). - place all dough to baking tray and leave to proof for another 20 mins. - brush on egg glaze, then bake at 190'C for 20 mins or untill golden brown. Actually, I was trying to relax myself a little through baking. Yeap, having lots of fun for sure! Don't they just look like some green crawling little thing.....caterpillars? ^_^ Ooops...I'm going to bite on them. 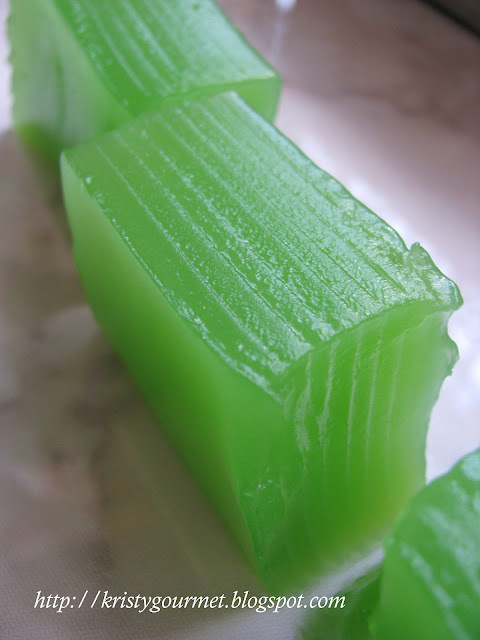 For pandan flavour mung bean paste : replace water with pandan juice plus an extra 200ml water for steaming, and stir in 100ml cooking oil after steamed untill you get smooth paste. It's best to chill before used. Hi guys, just to show you how's my finger getting on! The skin looks fine but not the sensibility. I think it's only 80% healed. Not the same anymore! However, thank you so much for everything, dear friends. Am really appreciate for all your concern. Haha very cute! 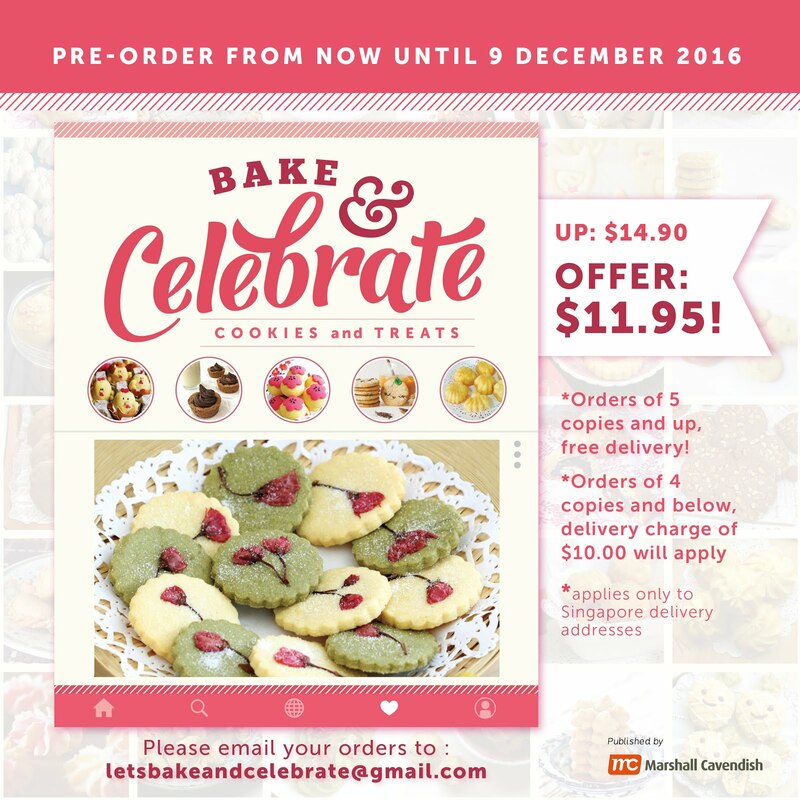 Love the pandan filling! 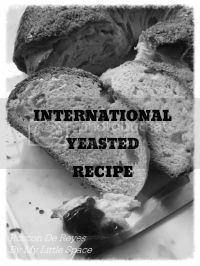 when i was amazed by how good the bread looks, i got completely freaked out when i scrolled down for the recipe, and saw your finger! i'm glad it looks like it is healing pretty well! Your finger is healing beautifully, give it time, soon u will be 100% again. Kristy, That caterpillar looks so real ~~amazing, so pretty cute! I want your caterpillar.. they look so cute! 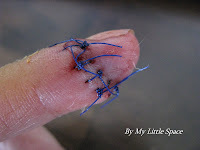 But i dont want to see your finger in stitches..what happened, Kristy?? my goodness, it must be very painful!! Kristy, so glad to see your finger healing up nicely. Both my mom and dad had injured one of their fingers badly. They do heal, but like you say never quite the same. My dad lost a tip of his middle finger and said you never realize just how much you use the tip, even of one of the mid fingers. Anyway...theses caterpillers look gorgeous! So pretty and green and lined up in the pan just waiting to be eaten! Yumm! Hope things are well with you and your family! Very cute, they surely look like caterpillars! Bet it is delicious! Glad to hear your finger is progressing and I hope it is back to normal soon. Those look so cool. I don't think I can get mung bean paste around here, is there anything you can substitute? Lovely bread with the early summer colour, and glad to see your finger is recovering a lot!! They look so pretty! You are a profi in baking! Yummy caterpillars...would love to try it one day. Glad your finger is healing nicely. :D Cheers! Whew, that's quite a wound on your finger. Glad it's healing nicely. Love the color of your bread. I don't know if I've ever tasted mung bean paste. Super cute! I love these caterpillars! My little nephew has a toy caterpillar which he drags everywhere. Good to see that finger of your doing a little better. I bow to your baking expertise - I don't seem to have the patience. When I see your results, I start wishing I was more like Kristy. Yay for fingers and healing! You're an extremely talented baker Kristy! These are so cute! Save one for me! Your poor finger - hope it gets back to 100%. KRISTY HOLY CRAP!!! Your finger!!!! :( It looks like you almost chopped the whole sucker off, I am SO glad you are okay!! *hugs and kisses* I am happy to hear your finger is recovering, it looks painful. Happy belated birthday to your beautiful daughter btw! Sowmya : Yes, they are. Thanks! SKucing : Come & get it! Belinda : Me too! I love green. Thanks alot. HH : Eeeerrr...Frankly, I hate caterpillars! Some of them will cause terrible itchiness to our skin. Claire : Yeah, nearly chopped off my finger last month. Lucky, it's still with me now. So, you want a caterpillar... guess you can get plenty of them at the nearby bushes! hahaha.... Just kidding! Lyndsey : Oh dear, we get the small cuts all the time but the big one sure frightening. But fortunately, we still carry the fingers. Same to you! Pam : Thank you, dear. Just cross my finger! Bob : Emm...maybe you can try with nutella! I'm sure that's pretty tempting as well except the colour. Wendy : If you're a newbie then I'll explain all the details step by step to you. If you're not then you should know what to do with the dough...*wink*. Maybe in future, I'll put details in my cookbook! hehe... Eh, so cheeky huh! haha.... Isn't great if someone make a comment on your post for details? Thank you everyone for spending your valueable time here with me. Hope you're having a wonderful day. TheLacquerSpoon : Thank you very much. I was wondering how's the summer over in Japan! Angie : Thank you very much for your nice words. Realy appreciate it. Jeannie : I'm sure this is as easy as 123 to you! I know you just love having breads too. Cathy : Mung bean is something really nutritious and delicious to be eaten. Maybe you should try it sometme. Drick : Hi there, nice to see you around. I know I know.. it's been a while. Will visit you after this. See ya later! MilleParadise : Thank you! Yeah, it was pretty painful when they took out my stitches too. Ahhh... you really know how to pamper yourself. haha.... Well, it was slowing me down at the beginning but not anymore! Claudia : Simple then just call you Kristy! hahaha....& thank you so much. Reeni : Thank you so much for your kind words. You can have them at anytime. My finger, so far so good! Thank you guys for stopping by and spending your time here. Hope you're all having a great day. Fimere : Merci beaucoup pour votre sollicitude. Oui, j'ai de la chance parce que le doigt est toujours avec moi! 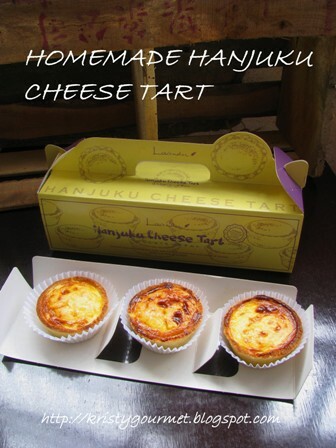 That is one of the cutest desserts I have seen...I love it...I hope your finger gets to 100% soon! Wow! Does your finger still hurt?? Glad it's better now though! These buns look delicious! They look so professional! 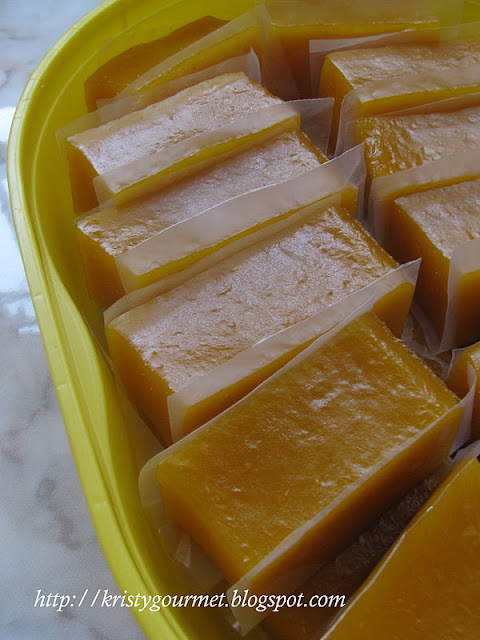 I love the colour of the mung bean paste =P It looks really cool! I'll have to try this one day- it looks really cute! Bo : Thank you so much! Von : My finger doing fine. Thank you very much. Wish you luck, dear. Thank you guys for visiting and hope you're having a fantastic day. they look gorgeous and delicious!! i'll definitely be trying out this recipe! glad your fingers healed! it looked like a really bad injury..
WoW! Delicious caterpillar! 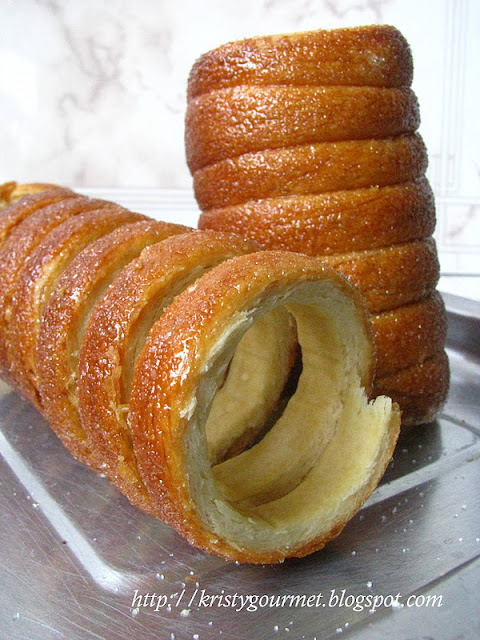 I don't have any idea that some day I will get the recipe of sweet caterpillar! Now caterpillar is in and I am looking for the butterfly! hehe! On a serious note Kristy I am very sorry to know about your injured finger. I am happy to see that you recovered a lot. May God bless you and may it heal soon. Bakies : Welcome to my humble little space. Hope to hear from you more often. Penny : I believe in you and hoping you believe in yourself too! Alwayswinner : Thank you so much, daaahling! That's so kind of you. I'm surely looking forward to your beautiful little butterfly. Thank you all for stopping by and spending your time here. Hope you're all having a wonderful time. Hey Kristy, glad that your finger healed! Have a nice day and marvellous weekend ahead! Hi Kristy, I'm so glad to read that your finger is almost healed. These caterpillars look so good and sound great with mung bean paste. Adorable! It DOES look like a caterpillar, Kristy. :) Clever idea to cut the dough in that manner. So glad your finger has healed well. Hopefully, all sensation will return. I did the same thing years ago (also my index finger), can still feel the scar across the finger and while sensation is there, it's not quite the same as my other finger. Glad your finger is getting better! Hope it'll be 100% soon!!! 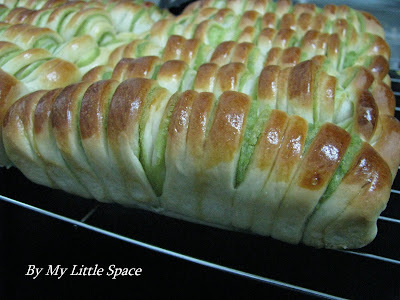 Hi Kristy, the bread looks so cute and yummy and glad to hear ur finger is healing well, take care. It still looks painful to me. Still you have to take care, ok? Barbara : My finger will never feel the same anymore but it's alright! I've already get used to it. Glad that it still with me. I'm truly blessed. Louise : Thank you! Btw, best wishes to your upcoming picnic party. Have fun. Tigerfish : I will! Thank you so much for your concern. Thanks alot guys for spending your time here with me. Hope you're going to have a terrific weekend. Hi Kristy - I had no idea you injured your finger! I actually felt a bit dizzy when I saw the picture of your stitched finger!! Hope it's feeling better now. I'm amazed that you still can make things like this caterpillar roll even with a finger like that!! You named them well, so cute! Take care of your finger and have a great weekend! Oh wow, you're so creative! You did an amazing job! Oh,I have been so busy that I missed your accident. Your finger seems to be healing wll, but of course, for all those nerves that were severed to connect again it will take sometime. Glad to see you back in action! AM glad too that your finger is much better now - hope you are 100% soon. 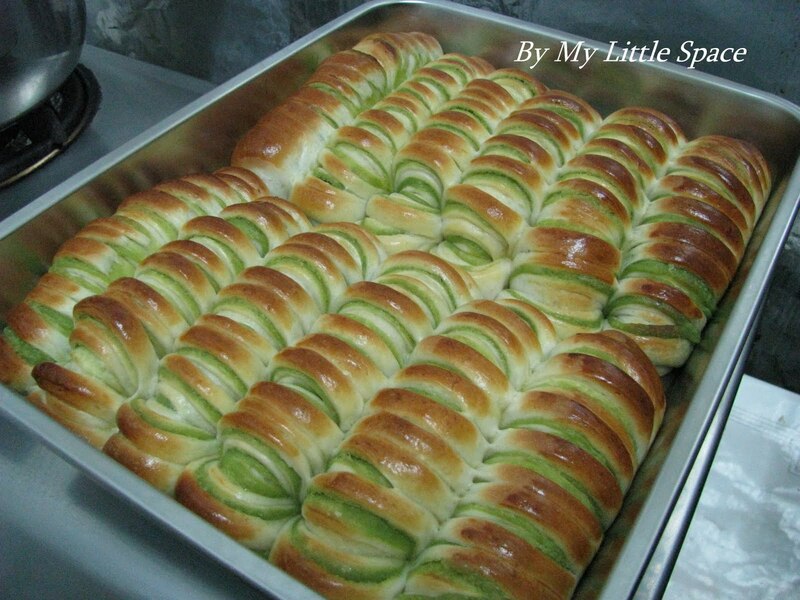 Lovely caterpillar bread as well. Your caterpillar is genius, I love it! Almost too cute to eat ... almost. I'm glad your finger is healing up - how traumatic it all must have been for you! Glad to hear that your finger healed nicely. The caterpillar looks so cute! Lovely bread, it looks delicious. Glad your finger is all better. Phew!